GGREEN OASIS: Donovan's offers a nostalgic reminder of the Woodside of years past. 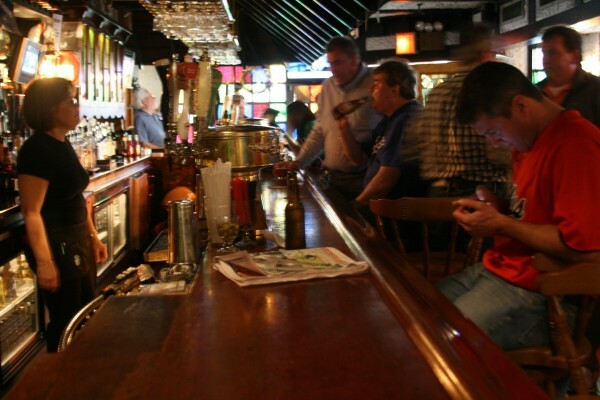 QUEENS – Once a month, you’ll find the four Donovan brothers in Donovan’s pub, catching up over a hamburger and a cold beer. Though they are not related to the owner, they feel right at home. The Irish pub and restaurant has occupied the corner of Roosevelt Avenue and 58th Street since 1966. 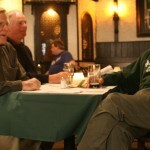 Almost as soon as it opened, Donovan’s became the local hangout for Irish Americans looking for a traditional meal of meat and potatoes at an affordable price. 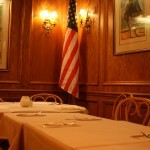 The establishment did so well that it grew over the years from one dining room to four. But the old Irish neighborhood is not so Irish anymore. When you get off the 7 train at 61st Street and walk west down Roosevelt Avenue in “Irish Town,” there’s a Colombian Bakery, a Thai restaurant and a Vietnamese supermarket that is usually the busiest place on the block. Most businesses feature bilingual signs declaring both English and Spanish are spoken inside. The 14-square block area immediately around Donovan’s has gained more than four hundred new Asian residents, primarily those of Filipino and Chinese descent, over the last decade, according to the 2010 census. The Hispanic population has dropped since 2000, but still represents 36 percent of the neighborhood. And for the first time ever, the white population is no longer the majority in Woodside – now representing 45 percent, a seven percentage point drop since 2000. “Woodside is thought of as an Irish community, but it’s changing and evolving,” said Jack Donovan, the owner’s brother and current manager. “If someone wanted to open a bar like ours now, I would tell them to go to Savannah, Georgia” which holds the biggest St. Patrick’s Day Parade in the United States. With the changing population comes a changing palate. 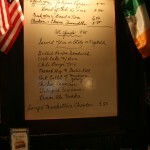 Many of the comfort foods served at the Irish American pub don’t appeal to newer residents from India who are vegetarian. In recent months, Donovan has seen more people from the Latino and Filipino communities come in for a bite. “Certain people who still eat meat, we get them,” he said. Though business is not what it used to be, the pub doesn’t plan on changing. “We earned a reputation for having good food at affordable prices, which is what we still have today,” Donovan said. Most of Donovan’s patrons are longtime customers like Maureen Fusco, who’s been dropping by for 43 years. She said walking around the neighborhood where she lived for decades before moving to Jackson Heights has been educational for her. From Pakistani to Spanish, she’s picked up on new languages and tried out new foods. Still, her first stop in Woodside is always Donovan’s. Sometimes Fusco comes in by herself for a burger, but most times, she arrives with her friend Dorothy Carroll, who has lived in Woodside for 40 years. Carroll said you might not see the diversity of the neighborhood when you walk into the restaurant, but you can see it at St. Sebastian’s Roman Catholic Church across the street, where the congregation now comes from four different continents. “Walk around here on Sunday, you’ll see the change,” Carroll said. 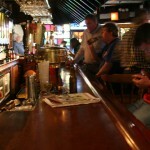 But the change on the streets hasn’t had a lot of effect on the bar itself. 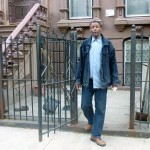 It’s still a place for longtime residents looking to reminisce. “On Saturdays, people, the majority of them Irish, bring their kids to relive something. You remember Donovan’s from when you were younger and it still manages to be the same,” Carroll noted. 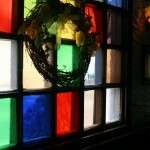 With benches that look like church pews, stained glass windows and dark oak walls, Donovan’s might seem more a place to pray than throw back a drink. The decor hasn’t changed the late ’60s. Donovan said locals often come in and thank him for not changing the place. A woman recently came back with her kids. She wanted to show them where her and her husband had grown up. She told Donovan she was glad to see that after 20-something years the place hadn’t changed a bit. With Tiffany windows and light fixtures, Donovan’s was designed to look like a church. 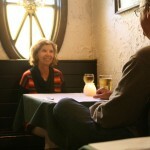 GGREEN OASIS: Donovan’s offers a nostalgic reminder of the Woodside of years past. 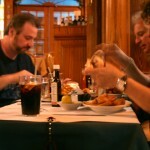 The Irish American pub is known for their award winning burgers. Edward F. Schwartz Jr. grew up in Woodside and took his wife to Donovan’s on their first date. 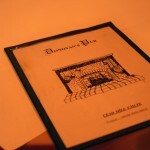 The menu reads “Cead Mille Failte,” a hundred thousand welcomes in Gaelic. When Mary and Joe Bruscella come to visit their friend Tony Styleanou, who’s lived in Woodside for 25 years, they always grab a bite at Donovan’s. 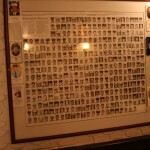 Jack Donovan, a retired NYPD officer, celebrates the lives of those who have fallen. Jim and Margaret Esposito have been coming to Donovan’s for 25 years. This room, the newest, was built from the floor up by Irish woodworkers.